Active gas protection systems for ground gas protection. PAGeoTechnical’s active gas protection systems utilise combinations of barriers, fans and vents to maintain a safe environment below buildings. Industrial and commercial units, as well as public buildings, are eminently suitable for the installation of active gas protection systems. They are typically larger, (BS8485 type D), or have more complicated subfloor structures, and are generally “managed”. This allows the advantages of active systems – both technical and commercial – to be utilised. Active systems utilise electromechanical means of enhancing the ventilation system either running constantly or via a switched system. 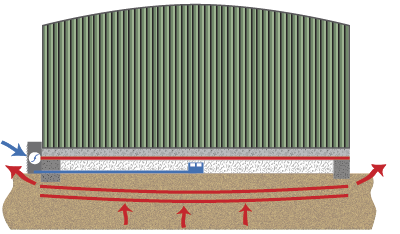 Designed for low to medium risk sites, Clean Air Blanket (CAB) is often the most cost effective solution for gas protection for industrial or commercial buildings. Utilising the standard damp proofing of the building and offering combined ventilation and barrier, CAB has probably the least impact on construction of any gas protection system and therefore offers construction as well as commercial advantage with provable performance. Air is introduced and the void former ensures consistent flow irrespective of building size or complexity. 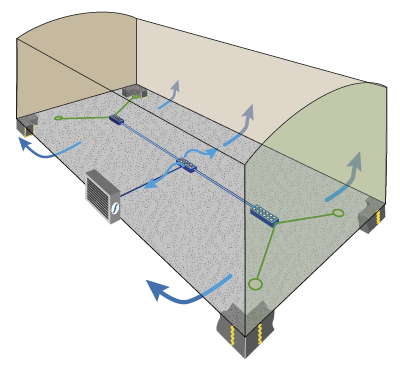 In the event of power failure a passive relief system operates to allow pressure relief and limited passive ventilation. Constant performance irrespective of wind speed. Dilution/dispersion based on air changes. Cost effective w.r.t. well designed passive system.